Last week, I was feeling a bit under the weather. So, I decided to stay home one day and pamper myself. I spent the afternoon flipping television channels and watching one home design show after another. The one dominant theme in practically every single episode was a move to make a small, walled-in kitchen into a larger, open concept kitchen. Doing that not only meant knocking down a few walls, it meant rearranging where the fridge, stove, range hood, and other important kitchen elements lived. I had to admit that in every case, the changes the designers made were impressive. The new layouts improved traffic flow through the kitchen and updated the look, too. Feeling like a change? Take a look at some of these unique kitchen design ideas. I love the look of the kitchen below. The circular work-eat space keeps anyone who’s not cooking out of the immediate area while still allowing conversation to flow. Many of us are stuck with the tiny kitchens originally built into our homes. Renovating isn’t always an option whether it’s because our budgets don’t allow for it, or the house itself just doesn’t offer enough room to expand or change the layout. There are ways of maximizing the limited space in a small kitchen, and making it look larger than it is. A mirrored backsplash goes a long way in tricking the eye into believing the kitchen is larger. Filling as much space as possible with cabinets will also help make the kitchen more functional. What are your own kitchen issues and wishes? This entry was posted in Home Improvement, Kitchen Design, Kitchen Tips, Range Hoods and tagged kitchen design, kitchen layout, modern kitchen design, small kitchens, small spaces on November 10, 2016 by Mila Hose. In many homes, especially older homes, you may not be able to make the kitchen bigger. However, you can do the best with what you have and make the kitchen feel larger. There are some tactics for making the most out of a small kitchen. Having a small kitchen will not limit you in terms of style or functionality; you just have to be creative enough to make the space work. While brainstorming ideas, you may also want to review our blog post DIY Kitchen Projects, which includes ideas for DIY storage space in kitchens. These projects will help de-clutter small kitchens and give you more space to work with. As a rule of thumb, the less construction you have to do to make your space work, the better. Less construction means less money spent on costly changes and the ability to make faster changes, so you can start enjoying your new and improved kitchen. The following are some minimal construction ideas you may want to take into consideration for your small kitchen. These projects won’t take as long as a full kitchen remodel. Create more space in your kitchen by knocking out walls in-between the kitchen and the living room space. Open kitchens are currently the hot trend; they make it possible for people in the kitchen to socialize with those in the living room and other areas of the home. Also, knock out doors that close off the kitchen from the rest of the home. Placing archways between the kitchen and living room is another trend in open kitchens, which creates a “wow” factor. As you’re redesigning the layout of your kitchen, think about moving the kitchen sink to a corner. This position takes up less counter space, which you will then be able to use for food preparation. If possible, replace kitchen counter tops for larger ones that give you more space for preparing food. The additional counter space will cut down on hassle and frustration you may feel during your cooking routine if you don’t have enough room to work. If you don’t have one already, a kitchen island (even a narrow one) can add more functionality to a small kitchen. It adds a place to sit while eating or socializing. It can also be used for storage and as additional prep space. Kitchen carts that roll around can be a great addition to a small kitchen. They can also be rolled under another surface to create more room when not in use. For example, you can roll them under a counter top or roll against a wall. You can instantly create more room to work in the kitchen by purchasing cutting boards and/or butcher blocks that go on top of the sink. This cuts back on the amount of counter space you are using while cooking. Slide out cutting boards that come out of kitchen cabinets are also a good space saver. Anything that can slide out when you need it, and slide out of sight when you don’t need it, will help you navigate your small kitchen. On that note, do not forget dining room tables that can slide under the kitchen island. These are also economic on space. Make sure whatever tables you have are on casters, so they can easily be rolled around. Backless stools can also be pushed under a kitchen island when not in use. With a table on casters and stools on hand, you can pull out a complete dining area that can be hidden after your meal is over. While choosing these kitchen accessories, choose items that are not bulky and that won’t take up too much precious space. For example, bar stools with narrow legs and small tables are easier to move around and won’t make the small space feel crowded. Remember, you are adding items to a space that is already small, and you don’t want to clutter it in the process. Lastly, consider installing ceiling to floor cabinets. These will create an illusion that makes the ceilings look taller as they draw people’s eyes upwards towards the ceiling. Thoughtfully planning out or redesigning the lighting in your kitchen can also create the feeling of a bigger space. Install task lighting under your kitchen cabinets that will light up the counter tops. You can also install big windows that allow more natural light to come into the room. However, be careful not to block out this natural light with large window curtains. One of the best and easiest ways to open up space in a kitchen is to get rid of clutter and to install smarter storage solutions. One of these popular solutions is floating shelves. These look great on walls above the counter tops. With these shelves, you will be able to get a lot of items off of the counter. Recessed shelving is another method for hiding away items. A third option is a pull out pantry that is flush against the wall when the doors are closed. You can also create additional storage on a small wall by adding magnets and racks. You can find magnets and racks that will not damage the wall; use them to hang pots and pans, kitchen utensils and spices. Alternatively, start a DIY project that repurposes an old door that you can hang your pots on. This will look chic and create smart storage. Replacing cabinets with open shelves also creates the sense of additional space and depth in the room. 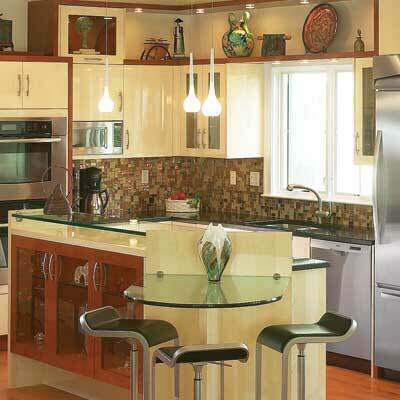 Then use the open cabinets to display your favorite dishware, knick knacks and other décor. You can convert your kitchen cabinets into open shelves by removing the cabinet doors. Feel free to dress up your new open shelves with a fresh coat of paint. You may need to re-plan your kitchen design to allow for better traffic, which will allow you to develop a more efficient cooking routine. This may involve discarding some appliances and/or replacing appliances with smaller versions, if the budget allows you to do so. There are compact and small appliances on the market made specifically for small spaces. For example, replace your fridge with a smaller one if you can manage with less refrigerated space. Install an under cabinet microwave instead of placing one on the counter top. The appliances you keep or replace may depend upon your personal preferences and cooking routine. There are design elements that help make a kitchen feel wider and roomier. High contrast designs are popular right now in small kitchens to make the area more visually interesting and appealing. Additionally, diagonal floor tiles can be used to make the kitchen look bigger. Remember to place elements in the kitchen that encourage the viewer’s eye to move upward the walls; this will make the ceilings feel taller. An easy way to accomplish this is to design a backsplash with vertical lines going up the wall. Remember that repainting the walls and/or cabinets lighter colors can assist in creating the illusion of more space as well. Don’t be afraid to go all out and make your small kitchen a glamorous one. A small kitchen is no better or worse than a medium or large kitchen. Your kitchen should reflect your tastes, personality and needs. All you have to do is come up with a game plan to make your small kitchen work for you. This entry was posted in Home Improvement, Kitchen Design, Kitchen Tips, Range Hoods and tagged design, home decorating, interiordesign, kitchen, Kitchen cabinet, kitchen design, range hood, range hoods inc, small kitchen, small spaces on March 16, 2015 by editor.